Tony Melÿndez may have been born without arms, but that hasn't stopped him from enjoying life to the fullest. Tony was born with this birth defect in 1962 as a result of his mother's taking the prescription drug, Thalidomide. Today he is known around the world for playing the guitar with his feet. He was thrown into the limelight when he performed before Pope John Paul II in Los Angeles in 1987. Visibly moved by Tony's performance, the Pope rushed into the audience to embrace him. In this program we meet Tony and see him perform in many locations. After hearing his inspiring story, you'll understand why he has appeared on numerous television shows including "Good Morning America," "The Today Show," "The 700 Club," and many more. He has also received several awards including the Inspirational Hero Award from the NFL Alumni Association at Superbowl XXIII in Miami and the Branson Entertainment Award for the Best New Artist in 1999. 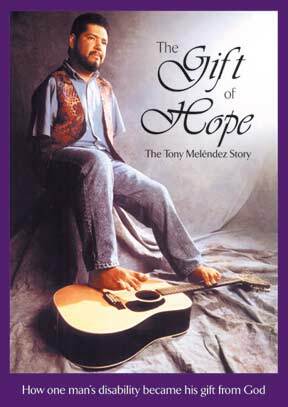 Tony's inspiring story will challenge viewers to embrace life and give hope to those in need. This DVD includes new footage showing Tony's life and ministry today.